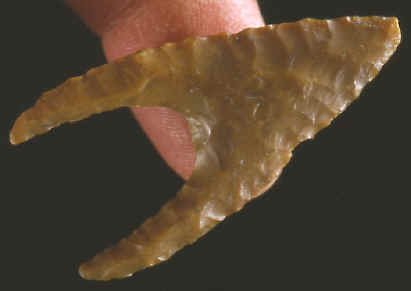 Hollow Base projectile points are roughly willow leaf shaped with a deep area hollowed out of their bases. They are generally finely pressure flaked on both faces and display thin biconvex cross-sections. The variation in size and weight suggests that most once tipped darts that were hurled with a throwing stick or atlatl, although, a few of the smaller specimens may have been actual arrowheads. Hollow Base projectile points are characteristic of the Egyptian Neolithic through middle Predynastic periods (ca. 5300 - 3300 B.C.). They are found throughout the Egyptian Nile Valley and even in the Western Desert, but are best known from the Fayum Lake basin just south of Cairo. Because they are so widespread, they are excellent "horizon markers" and makes it possible to date different cultures over a wide area. It is believed that they can be divided into regional variants but little systematic work has yet been done on this problem. Hollow Base points have deeper concave bases than any other projectile point in the world. One or more of their fragile "ears" are usually found broken off. Complete examples are fairly rare. It seems as I f they were designed to break on impact. Either that is the explanation or they were just poorly designed. Which is hard to believe since they were made and in use for approximately 2,000 years! Hollow Base points were hafted onto the ends of spear shafts by sliding the point into grooves cut on either side of the shaft. Hafted examples still exist in the museum at Cairo, Egypt. The Hollow Base point in this picture is made of an opaque yellow- orange chert and measures 1 7/8 inches long.